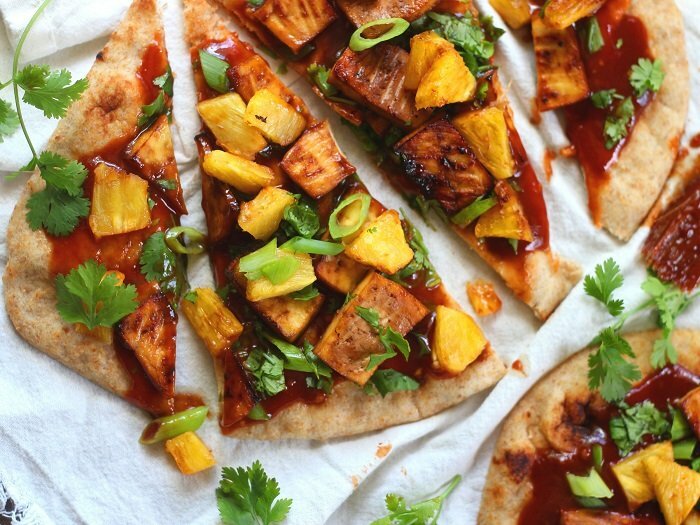 Fluffy wheat naan bread is topped with spicy hoisin barbecue sauce and juicy baked pineapple chunks in this flavor-packed little vegan tofu pizza. This post documents my first time ever eating pineapple on pizza. To be honest, I’ve always found the idea to be a bit strange. “Normal” pizza is made with red sauce and cheese, and those aren’t exactly flavors that I want to pair with pineapple. My husband convinced me that pineapple pizza was awesome though, and something I had to blog at some point or another. I don’t know about conventional pineapple pizza, but these little pies were out of this world. Maybe the best pizzas I’ve ever had. I couldn’t get over how good they were! And while I finally consider myself sold on the idea that pineapple on pizza is a good thing, I do think the other seemingly weird stuff I threw into this recipe helped with that. Since I resigned myself to putting pineapple on pizza, I went a couple of steps further and put tofu and barbecue sauce on there as well. More weird stuff. I’ve never seen a tofu or barbecue pizza offered at any takeout pizza place. They don’t know what they’re missing though. I went with hoisin barbecue sauce, because I thought some Asian flavors would go nicely with pineapple and tofu, and holy moly, I was so right. If you’d rather make a lazy version (and lazy is the whole idea of naan pizza, isn’t it?) 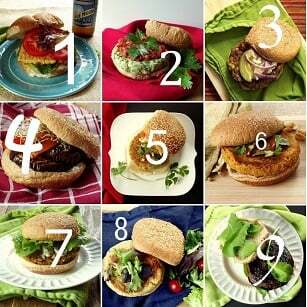 you can use whatever type of bottled barbecue sauce you’ve got on hand. 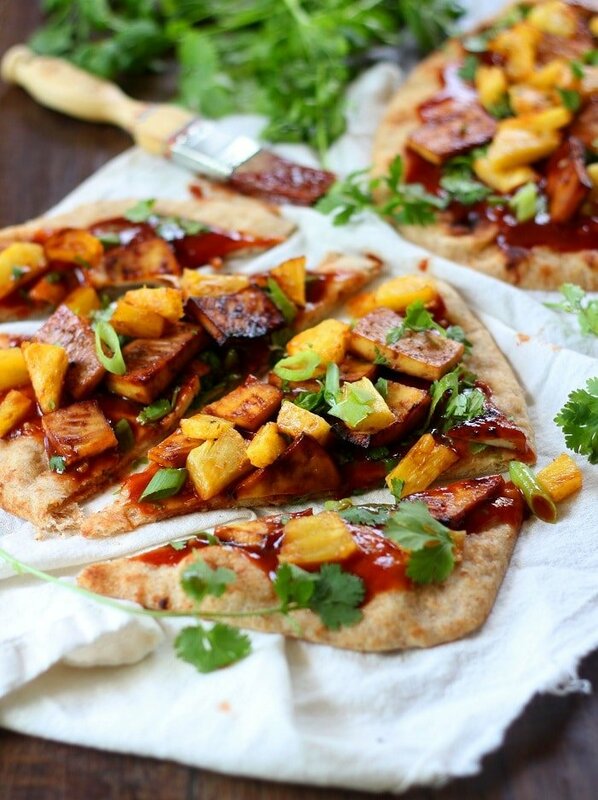 Fluffy naan bread is topped with spicy hoisin barbecue sauce and juicy baked pineapple chunks in this flavor-packed little vegan pizza. Slice tofu into squares with about 1 inch sides, about 1/4 to 1/2 inch thick. Stir soy sauce, vinegar, maple syrup or agave, and liquid smoke together in a shallow dish. Place tofu in dish and spoon mixture overtop to coat. Optionally, allow to marinate at room temperature for up to one hour (I skipped this step, so feel free to do so as well). Preheat oven to 400º. Line a baking sheet with parchmet and arrange tofu squares in a single layer on top. Bake abot 40 minutes, gently flipping and basting with any excess marinade about halfway through. Line a baking sheet with parchment and arrange pineapple chunks on top in a single layer. Bake until tender (oven should already be set to 400º), about 20 minutes. Optionally, brush with a bit of barbecue sauce, which should already be simmering on the stove (see next step), during the last. While tofu and pineapple bake, place all ingredients in small saucepan. Stir a few times to blend and bring to a simmer. Simmer over low heat, stirring occasionally for about 15 minutes. Optionally, place naan loaves into 400º and bake just until hot, about 3-4 minutes. Remove from oven and spread with hoisin barbecue sauce. Top with baked tofu, pineapple chunks, scallions and cilantro. Trader Joe's carries vegan naan, though the loaves are a smaller than normal, so I'd suggest using three loaves instead of two. 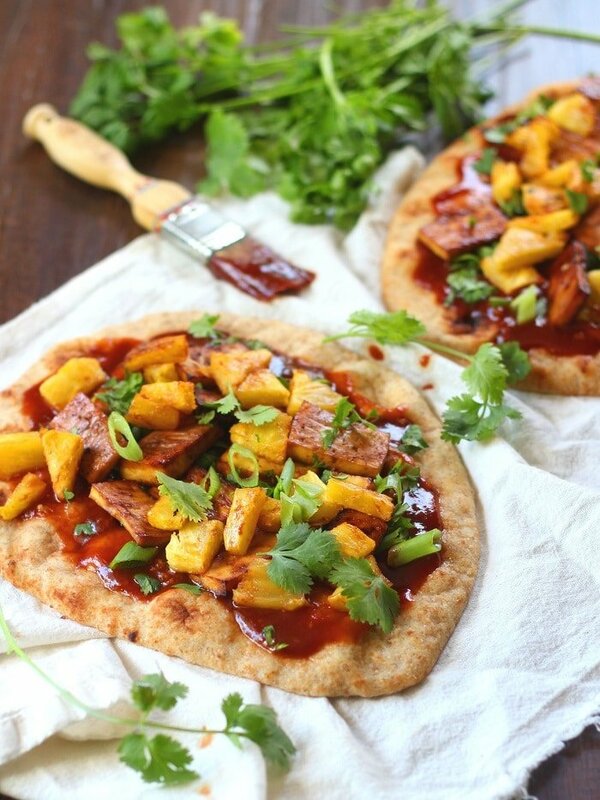 Also check out Indian markets for vegan naan, or make your own - it's easier than you think!. If can't find vegan naan or prefer to, you can go with a conventional pizza crust. Double the recipes for the toppings and sauce to make 1 large pizza. I haven’t been able to get enough bbq lately. I love the woodstock farms original recipe but this looks like an awesome alternative. I was marinating skewers with pineapple in the sauce so I know it’s a match made in heaven. This looks like a great option!!!!! Oh yum Alissa this looks amazing. I actually don’t think I’ve ever had tofu on a pizza! 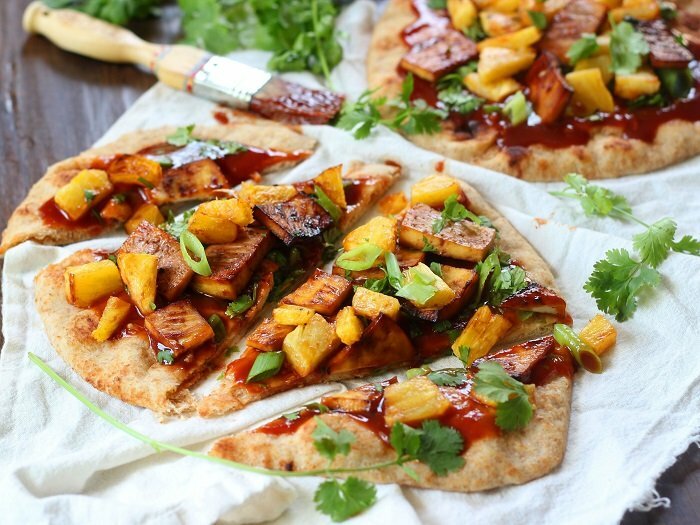 In my pre-vegan days, pineapple was my all-time favorite pizza topping! It’s that whole sweet and salty factor! You’ll have to try a traditional pineapple pizza with vegan cheese sometime. I promise you won’t be disappointed! I think these toppings would be awesome on noodles! Now I’m itching to try it!